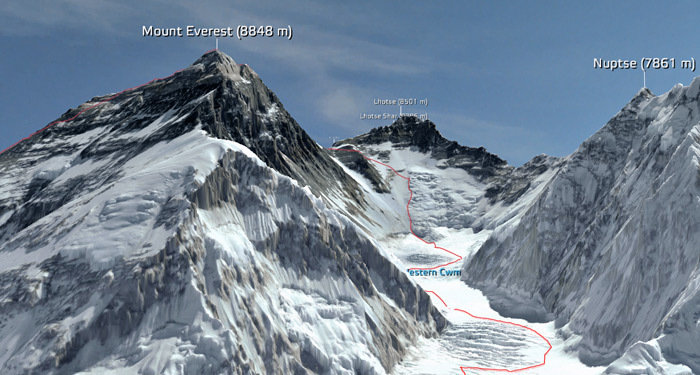 Mount Everest is one of the ten regions of scientific interest where this processed was applied. Using images from the Worldview-2, RapidEye, Landsat and SRTM satellite systems (some samples in the images below) the researchers created the 3D model from different angle shots. Along with the matching texture the result is spatial resolution of 50cm/pixel and height resolution (of course excluding recesses) of 50cm, currently the highest available for civilian use. Google Earth resolution varies between 90-30m. The software and know-how is largely based on the experience of DLR’s Institute of Planetary Research from the High-Resolution Stereo Camera (HRSC) apparatus, appeared in the photo below, which is part of ESA's Mars Express mission. The HRSC used a specifically designed sensor with 9 single CCD-lines that captured data in black & white, color (by using rgb filters), near-IR and also stereoscopic imaging. The later was possible by shaping the ccd-lines in such a way that part of the sensor is looking at 3 different directions. The central part is facing directly downwards, perpendicular to the surface and the other two are +18.9 or –18.9 degrees front and backwards looking respectively. The shape and height differences were calculated by the variations of these three data sets. Although the earth orbiting satellite images don’t have a stereo capable camera the data processing approach of images taken from different angles in order to create the 3D model of this Himalayan region was similar.